It’s no secret that many students in every grade level at schools across the country are struggling with their studies. But what if the answer for helping them blossom isn’t necessarily more time in the classroom or more teachers? To the contrary, could the answer be spending less time in the classroom and more time being outdoors playing or doing some form of exercise? This idea is not as far-fetched as you may think. In fact, research is now clearly showing that physical exercise is not only important for your kids’ physical health, but it is also important for their mental health and keeps their brains sharp and primed for learning. How does exercise affect your kids’ brains? Research shows that exercise positively affects your kids’ brain on many levels. For example, it increases heart rate, which in turn increases blood flow and oxygen to the brain. It can also improve memory and other brain functions. But many of those studies have focused on gray matter, the stuff useful for memory that shrinks in old age. However, new research says exercise and fitness boosts another kind of brain matter, the white kind (white matter defects are associated with certain neurological and psychiatric disorders). And in examining the brains and fitness levels of 24 children ages 9 and 10, scientists at the University of Illinois at Urbana-Champaign said white matter is thicker and denser in the fitter kids. Complementing this study, research from UCLA demonstrated that exercise increased growth factors in the brain, making it easier for the brain to grow new neuronal connections (connections between neurons i.e. brain cells). So what does all this have to do with academic performance? Psychologists at the University of Illinois at Urbana-Champaign found that fit children scored better in a series of cognitive challenges. The MRIs of fit kids participating in the study showed significantly larger basal ganglia, a key part of the brain that aids in maintaining attention and “executive control,” or the ability to coordinate actions and thoughts sharply. A separate study by the same institution found that fit children also have bigger hippocampi (part of the limbic system involved in the processing of emotions and memory). To do complex thinking, the hippocampus and basal ganglia regions interact in the human brain structurally and functionally. And yet another study showed a clear relationship between exercise and academic performance. In this case, 259 Illinois third- and fifth-graders were first put through an exercise routine. When they finished, their body mass was measured and they took math and reading tests to see how they did. The results showed that the more physical tests they passed, the better they did on the academic achievement tests. What’s more, these positive effects appeared regardless of gender and socioeconomic differences. How much exercise is needed to reap the benefit? 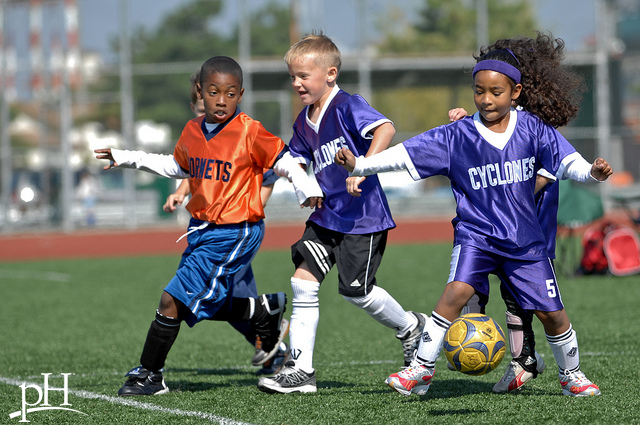 The National Association for Sport and Physical Education recommends 60 minutes a day for children and adolescents. Schools should provide 150 minutes per week of instructional physical education for elementary school children, and 225 minutes per week for middle and high school students throughout the school year. You can also help your kids by encouraging them to exercise and participate in sporting activities they like as well as ensuring they are getting the right nutrition and enough sleep.